It was mid-May, and several hours earlier Linda had boarded a mini-bus in Istanbul with around 35 other people, including children and a pregnant woman, eager to enter European Union territory. The trip had been organised by smugglers, and the passengers ended up in a remote area close to the northwestern Turkish city of Edirne. At around three in the morning they boarded small boats that ferried them across the river. Linda’s plan was to get into Greece, then make her way to Denmark, where her fiancé lives. Her crossing was part of a sharp uptick in traffic into the EU via the Evros (known as the Meriç in Turkish) this spring; 3,600 people are known to have crossed in April alone, compared to just over 1,000 in all of 2013. But she didn’t make it more than a few steps into EU territory before she was stopped. The men demanded that everyone in the group hand over their mobile phones. “Then they beat the men who were with us, put us in a boat, and sent us back to the Turkish side of the border,” Linda recalled when she spoke to IRIN recently in Istanbul. Pushbacks like the one Linda experienced have been going on for years, documented by both human rights watchdogs and the UN’s refugee agency, UNHCR. They are also illegal under European and international law. According to a report released by the Greek Council for Refugees in February, before the spring rush, pushbacks have increased to the point of being “systematic” as the number of people crossing the Evros has grown slowly in the past two years. The Evros River border between Turkey and Greece is one of the easternmost frontiers of the European Union. Until a fence went up on all but 12 kilometres of the Evros in 2012, it was the easiest and safest path for asylum seekers from the Middle East and elsewhere to reach Europe, and nearly 55,000 people crossed the border irregularly in 2011. A controversial 2016 EU-Turkey deal that paved the way for asylum seekers to be returned from the Greek Islands to Turkey (which it deems safe under the terms of that agreement), does not apply to the Evros border. Instead, there is a separate, largely ineffective bilateral readmission agreement dating from 2002 that was suspended earlier this year. Even under the terms of that agreement, pushbacks like the one Linda experienced violate European and international laws on refugee protection, which require states to allow asylum seekers to file for protection and prohibit sending them back to countries where they may face danger. While countries are allowed to protect their borders, they cannot legally return people who have already crossed without first evaluating their claims. Pushbacks may be illegal, but they are an open secret. “It’s something that everybody knows,” said Dimitris Koros, a lawyer with the Greek Council for Refugees. Now, when an asylum seeker enters Greece from the land border, “the first thing you encounter is the possibility of being pushed back,” he added. The Greek Ministry for Migration Policy did not respond to IRIN’s requests for comment, but the Greek government has repeatedly denied it is engaged in systematic pushbacks. It’s unclear just how many people have been pushed back or who is responsible, because the area around the border is a closed military zone and there aren’t many NGOs working in the region. Meanwhile on the Turkish side of the river, security forces regularly apprehend people attempting to cross and transfer them to government-run detention centres. But amidst a pervasive atmosphere of fear and silence, the treatment of asylum seekers and migrants after they are pushed back and detained largely remains a mystery. According to Tsitselikis, pushbacks have been happening for decades. Although the border is technically a military zone, these days border police patrol the frontier as well as personnel from the EU border control agency, Frontex. People who have been pushed back, including Linda, describe being met by security forces wearing different types of uniforms, but it’s tough to assign responsibility. “Since it takes place outside of the public eye, we don’t really understand who is responsible,” Koros, from the Greek Council for Refugees, said. When asked about the practice by IRIN, Nikolaos Menexidis, police major general of Western Thrace, the Greek region that borders Turkey, said Hellenic police always follow the proper procedures when dealing with migrants. Menexidis said his forces have been working with Turkish police for the past six years on what he calls “technical issues.” They primarily exchange information on stopping smugglers on both sides of the border, he said. Most of the border between Turkey and Greece is lined with barbed wire fence and cameras. Linda’s ordeal did not end when she was pushed back into Turkey. The smugglers who brought her group to the border were gone and so was the bus. Without phones to call for help, the group was stuck. After waiting several hours, they tried to cross again. This time they made it further, walking for five or six hours in Greek territory before they were stopped, taken to a detention centre, and placed in a room with people from many different countries. A group of Turkish soldiers found them in the woods and brought them food, water, and milk for the children and pointed them in the direction of Edirne, where they arranged for taxis to bring them back to Istanbul. In a way, Linda was lucky. Last December, the Greek Council for Refugees documented the case of a Pakistani man who died of hypothermia after being forcibly returned to Turkey. He had fallen into the cold water on the way back. While the Evros is no more than a few metres wide, its current is deceptively strong and, according to records in Greece, at least 29 people this year have died while trying to cross the water or shortly after. Some who are forced back to Turkey face serious punishment. Since a failed military coup in 2016, the Turkish government has jailed tens of thousands of opponents, leading to an increase in the number of Turks fleeing to Greece to seek asylum – nearly 2,000 in 2017 compared to just 180 the year before. The Hellenic League for Human Rights has documented two cases of Turks being pushed back from Greece at the Evros and later being imprisoned in Turkey, including journalist Murat Çapan, who is now serving a 22.5 year sentence for “participating in a terrorist organization and attempting to overthrow the constitution”. Despite documentation, human rights advocates say they have struggled to bring attention to the issue of pushbacks, as EU and international policymakers focus on stemming Mediterranean crossings. There is little appetite in Europe at the moment for monitoring or changing policies that are keeping asylum seekers and migrants from entering the EU. “Both the European Union and the Greek government… prefer not to open this discussion, especially in this political environment,” Tsitselikis said, referring to the rise of right-wing, anti-migration politics in Europe that is shaking the foundations of the EU. In early June, about a 10-minute drive from Edirne, hundreds of people in the parking lot of what the Turkish government calls a “migrant removal centre” huddled under tin pavilions that offered shade from the afternoon sun. This is where those caught on the Turkish side of the river are brought. IRIN visited three times over the course of a week to try to gain access, but never received a response to our requests. The centre is surrounded by a low wall topped with a chain-link fence and spools of razor wire. Each time IRIN visited, there were hundreds of people – mostly men, but also women and small children – in the parking lot and white vans passed in and out of the metal gate depositing more people. Two large charter buses idled in the parking lot with their doors open, seemingly waiting for people to board. In close to a week spent at the border, there was no concrete evidence of what was happening inside the centre. There were hints and rumours, but no one wanted to speak on record – including Turkish organisations that work with asylum seekers – because of the sensitivity of the issue. It is simply not clear how long people are kept in the centre, or what happens to them when they are removed. The Turkish Directorate General of Migration Management responded to IRIN’s requests for comment with links to online statistics and Turkish law on removals. Several Syrian and Afghan asylum seekers that IRIN spoke to shared stories of being held in such centres for a period of time before being released inside Turkey and permitted to stay. Most of the people IRIN spoke to reported good treatment while inside. But in 2015 and 2016, Amnesty International documented cases of Syrians detained while trying to migrate to Europe and being deported to Syria, according to Anna Shea, an Amnesty researcher working on refugee and migrant rights. Amnesty has also recently documented a case of a Syrian asylum seeker stopped in Edirne being deported to Idlib, the rebel-held province in northwestern Syria where a ceasefire is so far holding off a government offensive but humanitarians warn conditions are still dire. It is unclear if the case is part of a larger trend. In recent months, Turkey has deported large numbers of Afghans and Syrians, stopped after crossing Turkey’s southern and eastern borders, back to their respective countries. But it is difficult to know if this practice has been extended to people who have tried to travel to Greece, given that the organisations working on migrant and refugee rights were unwilling to speak on the record, and the government declined to comment on the issue or allow access to detained migrants. A deflated boat lies on the Greek banks of the Evros. At a small village outside of Edirne, a man herding goats pointed to places where people crossed the nearby river, but there was no sign of anyone during the day. Crossings happened only at night, he said. And the Turkish army prohibited people from approaching the river after 7 pm. The road leading from the village followed the winding course of the Evros, which was often blocked from view by thick stands of trees. The surrounding area was full of corn fields, rice paddies, and thick vegetation. 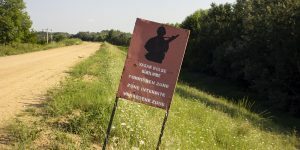 Small dirt roads that shot off in the direction of the river were marked with red signs carrying a stencilled soldier – a warning that entry beyond that point was prohibited. Not far away, in the city centre, everyone seemed shocked to learn that so many people had crossed the border this year. It was a problem that most locals assumed was already in the past, given that most of the frontier had been lined with barbed wire and cameras for the past six years. But those who have tried and failed to cross the Evros know that the rural quiet harbours dangers the eye can’t see. Linda has given up on seeing her fiancé anytime soon – a visa is likely to take years – and she isn’t planning on trying to cross the border again. “I started being afraid because of the things I saw,” she said.